Scientists in India have designed a nanoparticle-based drug delivery system that binds to the surface of the eye to deliver an antifungal drug. But the system is more than a carrier – it uses an intricate array of cooperative effects to target the site of an infection and administer medication in response to its severity. Fungal keratitis is a painful eye infection that causes blindness in 30% of cases in the developing world. Once established in the layers of the cornea, the fungus produces proteases that attack corneal cells causing inflammation and permanent damage. 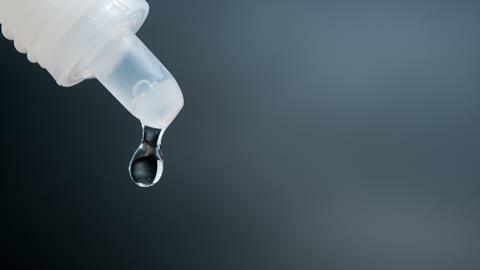 Theoretically eye drops could treat the infection – there are drugs that would work but blinking washes them away too quickly to be effective. Severe infections are currently treated with intense courses of oral antifungals and anti-inflammatories, and in the worst cases clinicians inject drugs into the cornea. Corneal cells under attack overexpress toll-like receptor 4 (TLR4) proteins, which prompt immune cells to release inflammatory cytokines. Saad Ahsan and Mohan Rao, from the Centre for Cellular and Molecular Biology in Hyderabad, reasoned that they could use these extra TLR4 receptor sites against keratitis. Anti-TLR4 conjugated gelatin nanoparticles can attach to the corneal surface, minimise inflammation by inhibiting the downstream pathway of TLR4 and act as an alternative substrate for proteolytic enzymes, minimising damage to the cornea while ketoconazole resolves the infection. The antibodies bind the nanoparticles to the TLR4 sites on the cornea, anchoring them to the area of infection as well as blocking the TLR4 receptors, which reduces inflammation. Gelatin delivers the active drug, but like the antibodies, it has another function – as an alternative substrate for the proteases attacking the cornea. When the enzymes attack the gelatin it doesn’t just give the cornea a break, it also speeds up the drug release. ‘So far we have tested this in rabbit and rat models, but corneal proteins are not very different so we believe this can easily be translated to human use,’ says Rao.